Warts are an ugly and embarrassing condition that nobody likes to see. If you’ve ever suffered from warts, you will know they can also be frustrating to get rid of. Any wart will disappear on their own in time but this can sometimes be a very long time, even years. Like me, you might not be keen to let Mother Nature do her work and wait that long. 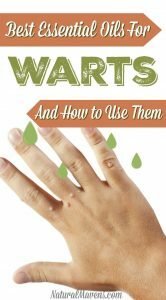 While getting rid of warts does take patience, luckily, there are some safe and natural ways to help. One of the simplest ways is using essential oils. 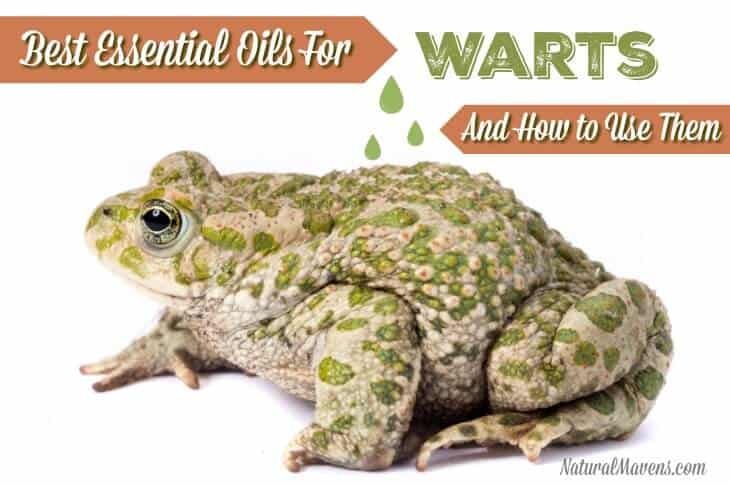 Here we’ll take a look at the best essential oils for warts and how to use them. The cause of warts is a virus called HPV (human papillomavirus). It stimulates cells on the outer layer of the skin resulting in a small, firm, hard growth. 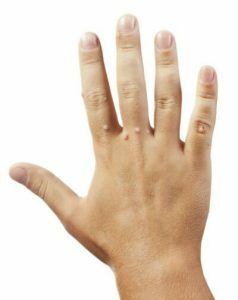 Warts appear most often on hands, feet, fingers, and faces. Warts can spread from person to person as HPV transmits by touch. This could happen through contact with someone who already has a wart, or touching a surface with the virus on it. But, even if you come into contact with the virus, you may not develop them yourself. This is because, not everyone is susceptible to warts. The health and condition of your own skin can have a role to play. Another factor is your level of resistance to the virus. Warts don’t discriminate and anyone can get them – children, adults, and even the elderly. 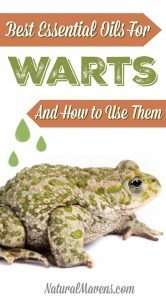 Most warts are harmless, but some can be painful. For that reason and the fact they aren’t very attractive, most people are keen to get rid of them. The best essential oils for warts are those that offer some antiviral properties. This combined with other properties that help treat the wart gives us the following list of oils. Tea Tree oil is an antiseptic, antiviral, and anti-fungal oil that is my number one ‘go-to’ for wart removal. If you only try one oil, in my experience this is the most effective. It is best applied neat straight onto the wart (see tips for application below). Discover more uses for tea tree oil here. Lemon oil is a natural remedy for viral conditions like warts and cold sores. It has a high d-limonene content, which is an anti-inflammatory aid. Plus, the anti-viral properties make lemon oil an excellent choice for treating warts. Oregano oil contains carvacrol and thymol, both of which are antiviral. Oregano oil has “hot” properties so don’t apply it direct to skin as it can cause irritation. Dilute it in a carrier oil before use. Frankincense oil is a top choice to get rid of warts. It is an antiseptic, disinfectant and anti-inflammatory that helps to shrink the wart’s size. Clove oil is a good choice when considering essential oils for warts. It is antiviral, antibacterial, antifungal, anti-inflammatory and an anesthetic. Clove oil kills the virus, shrinks the wart, and relieves painful warts. Thyme oil is a powerful natural remedy with antiviral properties. Like oregano it is a ‘hot’ oil that is best diluted before applying. Cypress oil is featured in many natural wart remedies. It helps to combat the virus with its antiviral and antiseptic properties. Cypress oil is also astringent which helps to reduce the size of the wart. Eucalyptus oil is antiseptic and antiviral. A common suggestion is to combine it with tea tree oil to boost its effectiveness. Eucalyptus oil is easier to find than some of these others and it is a good additive to your wart treatment. With all the properties needed to fight warts, lavender oil can be helpful as well. It is best used in combination with some of the other oils above and is an ideal choice when treating children. Whether using an essential oil alone or in a blend, it is best to apply them to the wart twice a day. Apply one or two drops once in the morning and once before bedtime. Place the oil directly onto the wart and avoid getting it on the surrounding healthy tissue. To help get it straight onto the wart, use a toothpick, cotton swab or dropper. Another option is to place the oils onto the inside of a bandage and apply it directly over the wart. Once the oil is applied, cover the treated area with a bandage (small round bandages are best). This keeps the oxygen out and helps the oil do its work. It is important to keep reapplying a bandage until the wart is gone. This combination works well to treat warts for kids and adults. The vinegar works to soften the hard growth while the oils work on the virus. Combine the following in a clean bottle, mix well and apply as above. Removing a wart isn’t an impossible task but it does need some consistency in treatment. When you begin treating a wart with essential oils, it is important to stick with it. The wart will disappear but be patient if it takes a little time. Essential oils are a natural way to get rid of warts without a trip to the doctor or using painful chemicals. Choose from one of the nine essential oils listed above, stick to consistent treatment and your warts will be gone for good. Kristy is an enthusiast for living life in a natural, sustainable and healthy way. She seeks out methods, recipes and products aligned with these values and shares them here at Natural Mavens.